The past couple of weeks have been busy. 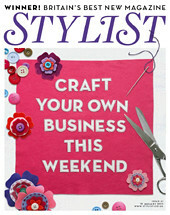 One particular busy day included the Stylist “Craft Your Own Business” event: a popular event as it sold out within hours! The event consisted of networking, with champagne flowing and a panel of four amazing women who were interrogated to within an inch of their life for their advice and successes, and, possibly more importantly, their misfortunes (finding the right accountants seemed to be a running theme…) by the Deputy Editor of Stylist. The four women were Claire: owner of Breckland Orchard, a “posh pop” company based in Norfolk and stocked across the country from delis and farm shops to National Trust properties; Emma: who started Honeybuns Bakery by selling her homemade wheat-free goodies to Oxford’s cafes and delis on her pushbike, her cakes are now also sold in supermarkets and even the staff restaurant of my day job; Chrissie: a traditional letterpress printer and partner of Harrington & Squires, a company created by a chance discovery of a traditional printing press in a garage; and Donna, owner and designer of Donna Wilson, a company created after making “odd knitted creatures” for her final RCA show. I bagged my seat at the front along with a couple of lovely ladies, including Betty, who I spotted from the other side of the venue and knew instantly she was a fellow bag maker as she had the same bag as one of the many that I have made, although, fortunately, not with me (could have been embarrassing...). After the panel we fought our way out of the room for drinks, canapés and to quiz the ladies of the Craft Council.